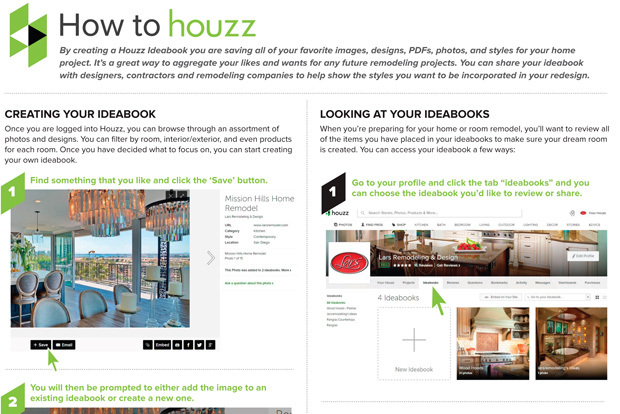 The Ideabook feature on Houzz allows you to save all of your designs and thoughts for your home project in one convenient, customizable place. This tool makes it easy to upload your own files and folders as well as save your favorites from Houzz. From notes and PDFs to home design photos and product shots, every detail of your home project is stored in a unique ideabook for future reference. Keep ideabooks for yourself or turn them into a joint project workspace by allowing others to add photos and comments. Sharing the details of your project with friends, family and home design professionals is as simple as changing a setting! For first time Houzzers getting the hang of this process can be a little tricky, so let us walk you through it. We have put together this valuable resource to teach you how to create, look through, edit and manage your ideabooks. Check out our free downloadable whitepaper and get started collecting and compiling inspiration for your next home project. And be sure to follow Lars Remodeling & Design on Houzz!